Why does fine hair gets damaged so easily when you use heat to curl and dry it? Are you one of those people with fine hair that loves the way you look in curls but are sometimes afraid to use the high heat of curling irons on it? You have a right to be concerned for sure. Fine hair presents kind of a double edge sword when it comes to curling it. You can curl it easier than most other types of hair but it’s also much easier to damage with heat while doing it. So what are you supposed to do? The answer to that is to get one of the best curling irons for fine hair. These curling irons have a wide range of temperature selections and other features that help minimize damage to fine hair when it’s curled. We will help you out with that by doing several curling irons for fine hair reviews and also tell you what to look for when purchasing a curling iron to use on your fine hair. 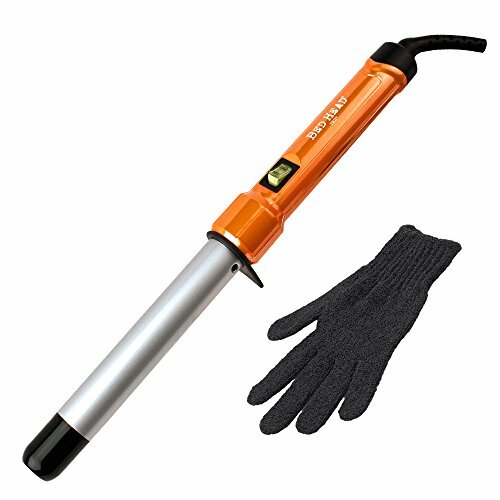 There is much to like about this curling iron from Beachwaver. The best thing about it as far as curling fine hair goes is its very wide temperature selection. You can set it anywhere from as low as 290°F to a high of 410°F. But the nice features don’t stop there either. This curling iron takes a lot of effort out of your hair curling process because it features dual-direction autorotation. 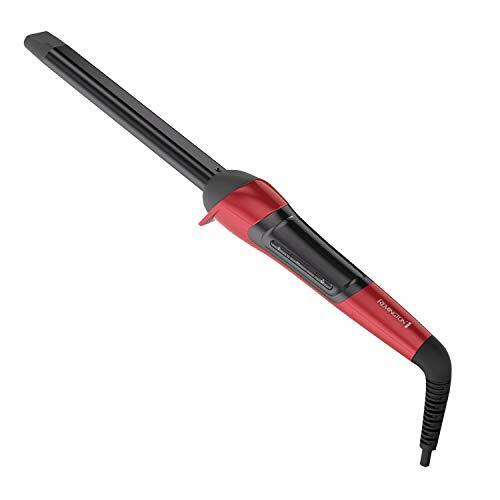 The Beachwaver S1 Curling Iron also has a ceramic barrel to distribute its heat evenly and a versatile 1” barrel size. 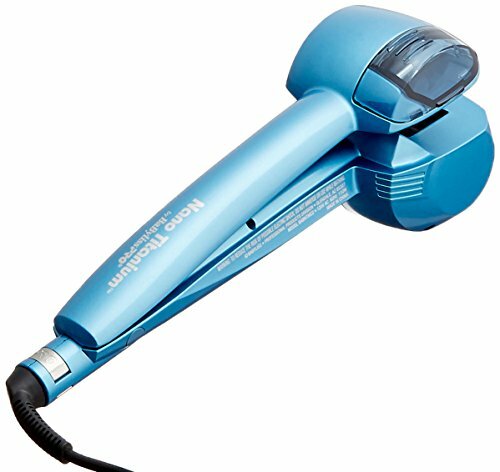 BaBylissPRO is a world-renowned hair products manufacturer and curling irons that are built like this one are the reason why. Even though it only has a low heat setting of 375°F, it is still very gentle on your fine hair thanks to its Nano titanium curling chamber and its innovative timer function that takes the guesswork out of curling your hair. It also has BaByliss’s own Smart Tech® safeguard technology and it’s ready to use in less than 30 seconds. Once you factor in its outstanding 4-year limited warranty you really have a very practical and unique curling tool here. This variable temperature curling wand has a lot of options that make it versatile enough to safely curl your fine hair. It all starts with the Bed Head Curlipops tourmaline ceramic infused barrel. This barrel promotes even heating so there is no damaging hotspots and helps delicate fine hair return more moisture during the curling process. The Bed Head Curlipops has a medium size 1-inch barrel and will also heat up as high as 400°F. Don’t forget the intangibles either. It comes with a 2-year warranty, includes a protective styling glove and is a dual voltage curling iron you can take with you as you travel anywhere in the world. Do you tend to find yourself in a hurry when you get ready in the morning? That is not a big problem when it comes to curling your hair if you won the Remington CI96Z1 Elliptical Waving Wand because it’s ready to use in less than 30 seconds. You will be able to make all types of curls in your fine hair thanks to its high heat (410°F max temp) and unique elliptical barrel design. This curling wand also boasts silk/ceramic infusion in its barrel to help it provide even and gentle heat for your fine hair. It’s an all-digital operation curling wand that is nicely backed up by Remington with a very generous 4-year limited warranty. Here is another curling iron that offers your delicate fine hair the supreme advantage of having even barrel heating and crystalline infusion. 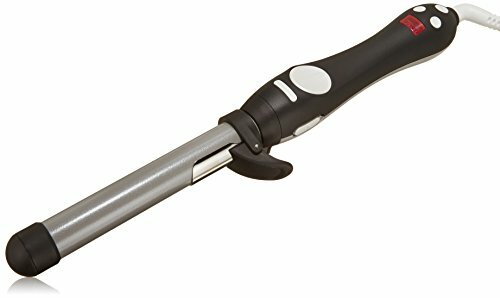 This Remington CI9538 Curling Wand has a unique pearl ceramic infused barrel. This innovative technology helps avoid the buildup of fine hair damaging hotspots and allows your hair to slide smoothly across the barrel as you curl it. 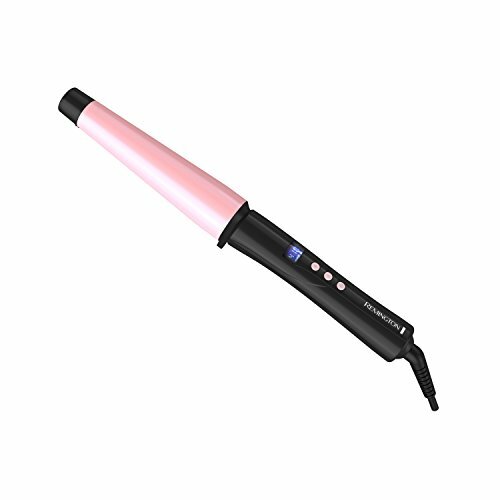 You can set this curling wand as low as 300ºF to help protect your sensitive fine hair too. When you factor in its versatile 1” – 1 ½” tapered barrel design, its digital temperature selection and its nicely designed temperature lock feature, this becomes a very well-rounded curling tool to use on your fine hair. There are two ways that professionals like to define hair. The first is by how close the hair follicles on your head are to each other. In other words, it simply means the density of your hair. As far as density goes your hair will be described as thin, normal or thick. The other way professionals like to describe hair is by the diameter of each individual strand of hair. Here terms like fine, medium and coarse are used. People tend to think fine hair cannot be thick and coarse hair cannot be thin but this is not the case at all. Is there a way to tell if your hair is fine, normal or coarse without scientifically examining it under a microscope? Try this test. Place a single strand of hair from your head between your index finger and your thumb. If you have a hard time feeling the strand of hair your hair is most likely said to be fine. Medium hair you can feel slightly and if the feeling is very pronounced your hair would be said to be coarse. You can also compare your hair to a standard size piece of sewing thread. If your strand of hair is less wide than the piece of thread you can rest assured that you have fine hair. So if your hair is said to be fine then your hair strands tend to get damaged by heat easier because of two reasons. For one, since it is not as wide across as medium or coarse hair the heat tends to build up in it faster and as a result, it loses moisture quicker than other types of hair. The other reason is because of the physical properties of a fine hair strand itself. Normal strands of hair have three layers and they are called the cuticle, cortex, and medulla. Fine hair is naturally not as strong as coarse or medium hair because it’s missing the inner medulla layer. OK, so now you know the reasons why your fine hair gets damaged so much easier when curling it than other hair types. So what features in a curling iron make it safer to use on fine hair then? Just because heat is a necessary evil when it comes to curling your fine hair does not mean you want to always use the highest temperature level on a curling iron when you are trying to add some curls to it. As a matter of fact, using a curling iron on its highest heat setting or using a curling iron that only has a high heat setting may significantly dry out and damage your fine hair.That is why you want to look for a curling iron that has a lower heat range and several different low heat settings. Preferably that curling iron will have a low heat setting somewhere between 200ºF and 325ºF.The more adjustable the heat setting is the better too. That way you can start out at a safe low-temperature level and increase it gradually until you find a heat setting that not only curls your fine hair easily but does so without damaging it. One of the most damaging characteristics of some curling irons is the fact that the cheap coatings on their barrels tend to build up areas that are much hotter than other parts of the barrel on them. 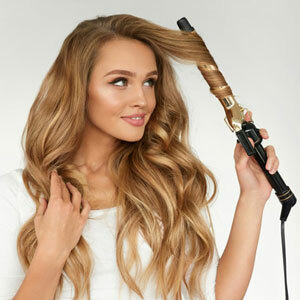 These are known as ‘hotspots’ and these areas of high heat can quickly and easily dry out and damage fine hair.That is why so many reputable curling iron manufacturers have started to add ceramic coatings to the barrels of the curling iron models that they produce. Ceramic coatings help eliminate these damaging hotspots by distribute the heat evenly throughout the barrel.In addition, ceramic coatings also help your hair slide smoothly over the barrel surface as you go about the process of curling your hair. Titanium barrel coatings act very similar to ceramic coated barrels. They tend to heat very evenly and your hair will also slide across them unrestricted as you are curling it. However, the advantages do not stop there either.This type of barrel coating also heats up extremely fast. In most cases, the curling iron will be ready to use in around 30 seconds. That means curling irons that use titanium coated barrels will help keep you on schedule as you get ready for your day.A few more benefits that titanium-coated curling iron barrels will give you is they will help your fine hair retain its critical moisture better and in turn, it will shine a little more too. 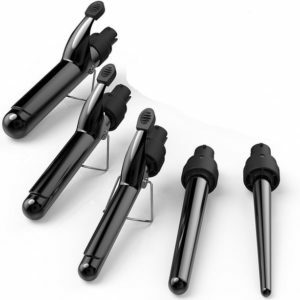 Titanium coated barrels will also resist corroding much longer than other types of curling iron barrels will. Sometimes as you brush, blow dry and curl your hair you will notice you get flyaway hairs that are very tough to style and they make your finished style look somewhat messy and unkempt. This happens because your hair loses some of its moisture as you style it and it builds up lots of positively charged ions too. This makes the strands of hair in your head naturally push away from each other and look unruly.So how do tourmaline infused curling iron barrels help with this problem? It’s because when these crystals are added to the barrels of a curling iron they are known to produce lots of negative ions. These negative ions not only help your fine hair retain its critical moisture better but also counteract the positive ions in your flyaway hair so it becomes cooperative again and can be more easily curled. According to experts, Nanotechnology is like tourmaline infusion on steroids. It is said to help your fine hair retain 25% -75% more moisture than those curling iron models that only have tourmaline crystal infused barrels. This is huge as far as maintaining the health of your fine hair and keeping it from drying out.Nano Titanium and Nano Silver ceramic barrel surface will also kill germs, help eliminate chemical buildup in your hair and give it a much healthier looking shine. It is important to prep your hair a little before the curling process. Most professionals will tell you this is best done the night before. Start by using a dry shampoo the night before. As you toss and turn during the night your hair will absorb the moisture from the dry shampoo and gain a little volume as a result too. You can also add some mousse the next morning to in order to gain even more volume. The longer your hair the more weight it naturally has. This weight will not only tend to take out the curl faster that you put in your hair but as it does this your hair will look thinner too. So cut off some of the length of your hair to reduce this weight so your hair stays thicker looking. Making sure you make your curl as close to the crown of your head as possible will also make your hair appear to be thicker. You have probably witnessed in the past how much fuller someone’s hair looks when the curl starts at the base of the crown and is found all throughout their hair. Quite the opposite is true when hair is curled closer to the ends and it does nothing to help make one’s hair look thicker. Ne trick stylists often use to make hair more voluminous is to start by making somewhat tight curls in a person’s hair. Once this has been done these tight curls can then be nicely brushed out to make to give one’s hair the appearance of being thicker. We already mentioned above that longer hair will naturally pull some of the curls you put in out because of its weight. So cutting it will not only help your hair look thicker after its curled but it will also help you hold your curl longer. Also, consider the type of curls you want to match up with the current cut style your hair has. If you choose the wrong curl to go with your cut shape then the curls may not stay in as long as you would like them to. It’s very true that you have to be careful when using high heat on your fine hair in order to avoid damaging it. There is a flipside to this too and that is you have to make sure you use enough heat to enable your hair to curl easily and then stay in place. Once your hair has been curled it also helps to hold your curl in place by using your cool air feature on your blower dryer immediately after you are done using your curling iron. If you are trying to make big curls with a smaller size barrel or vice versa then you are probably not getting enough heat in your hair as you curl it. This lack of heat will definitely cause your curls to fall out much faster. So be sure to match your barrel size properly to the curl size you are making. Use bigger barrels for bigger curls and small barrels for tighter curls. There are a lot of false assumptions when it comes to putting curls in fine hair. Many people assume it will be easier to add curl to hair when it’s not as thick in diameter but that’s simply not true. Curling fine hair is a tricky business and that is why you need a good curling iron to do it with. The best curling irons for fine hair are ones that have a nice blend of lower heat settings and damage reducing features. The models in our curling irons for fine hair reviews all tend to fit the above description perfectly. Anyone of them will do a great job of curling your hair without damaging it. If you feel none of those suits your needs, then be sure to look for the key features we discussed that any curling iron for fine hair should have. Either way, you should be able to find a professional curling iron for your hair needs. Best-Selling Curling Irons For Fine Hair!